Just steps away from the entrance to the park- if you plan to do the sunrise or sunset tours (which you should do- hearing the animals wake up as the sun comes up is amazing! ), then this hotel is a great place to be. Friendly, good food, convenient. I was very impressed with the attention that was paid to us by the staff. 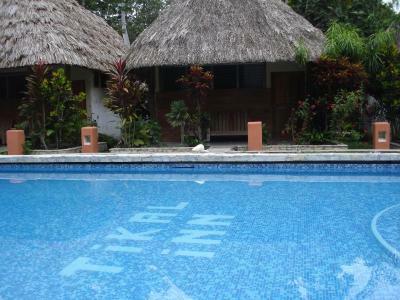 Since I live in a very noisy city; I was looking forward to the peacefulness of Tikal Inn. I loved how quiet and refreshing it was to disconnect. In the mornings you will hear the birds shipping, and at night you look up, and if are lucky, you will see the sky filled with stars. The staff was friendly and helpful. They always had smiles on their faces. The limited power gave me a chance to put down my phone and just expierence the nature I've never seen in this part of the world. Behind the hotel there's a little forrest trail with signs in spanish describing different trees. 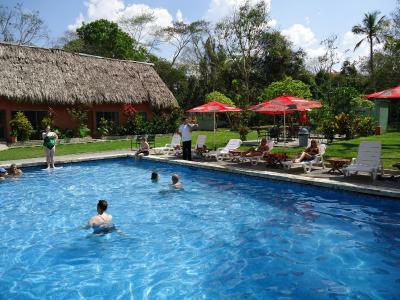 This hotel gives a great combo deal for the tikal sunrise tour that includes dinner and breakfast. Our guide Andreas was great. He got use close to animals, monkeys, and even spotted a big tarantula for us. The restaurant here was way better than I expected. And the pool looked very clean. The staff here are great. Great opportunity to practice your Spanish. Place very close to the ruins so it gives extra time to visit the site and not rush off. Also, the pool is a nice cool down after the spending the day outside walking. 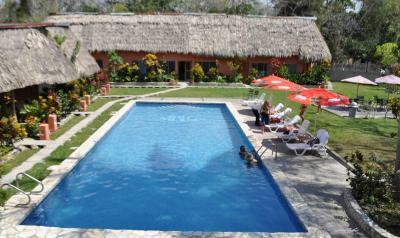 My friend and I came to Tikal Inn a little sick and were not feeling 100%. We took the first day to rest and utilized the facilities on the second day, ultimately, were beyond satisfied with our stay! The staff was very courteous, polite and professional. Roxy was amazing she gave us a tea with a local herb to help our sick stomachs and it was delicious and worked wonders for us. We got some bad sunburns at the pool one day and she let us cut some aloe vera from the garden for our skin. The location is perfect as it is right on the park grounds and was walking distance from the park entrance. 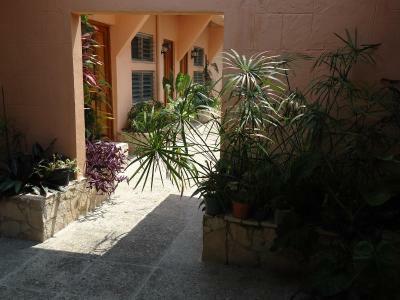 The grounds are decorated with beautiful plants, rooms have windows with screens, there is hot water available during certain times of day, and our room had electricity through the night with a ceiling fan. 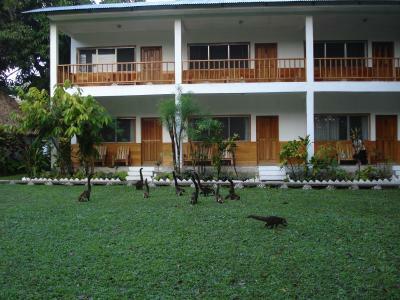 Tikal inn exceeded our expectations and I would highly recommend it to anyone considering staying in Tikal. 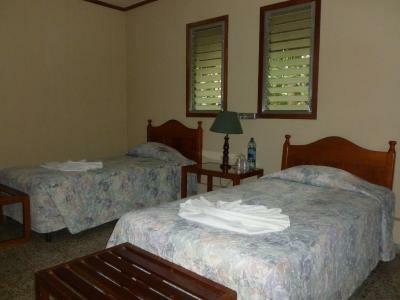 - Excellent location, a few steps from the entrance to the park. - Food was better than expected, considering you're in the middle of the jungle. - Excellent sunrise tour - although we didn't see the sun rise, the tour was very well organized and led by a wonderful guide. - Great pool! 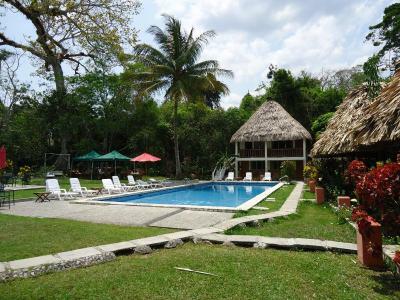 The location was great, staying just outside the tikal park entrance was great. 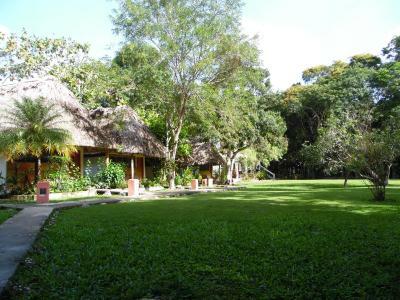 If you want the most tranquil setting right next to the Tikal National Park this is the place for you. Thenpersonnelmwere attentive,friendly and kind. There is no AC but each bungalow is is cool at night. My friend and I loved it! 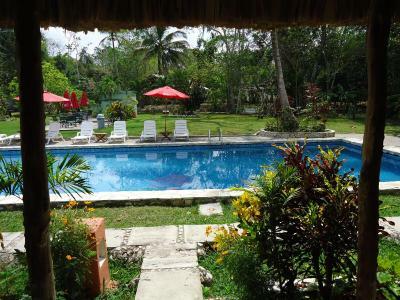 Tikal Inn This rating is a reflection of how the property compares to the industry standard when it comes to price, facilities and services available. It's based on a self-evaluation by the property. Use this rating to help choose your stay! Offering an outdoor pool and a restaurant, Tikal Inn is located within Tikal National Park. Free WiFi access is available on site. The functional accommodations boast a rustic-style décor and offer views of the surrounding garden. 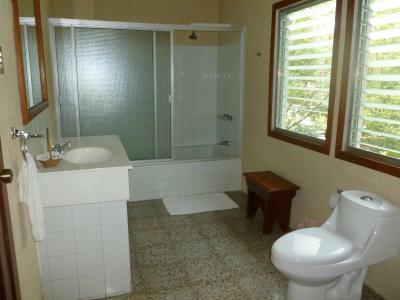 The private bathrooms include free toiletries. A fan and bed linen are also included. 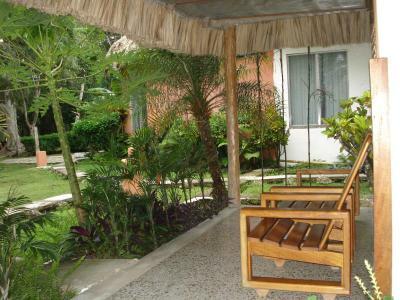 At Tikal Inn guests will enjoy of an airport shuttle, 24-hour front desk service and a tour desk. 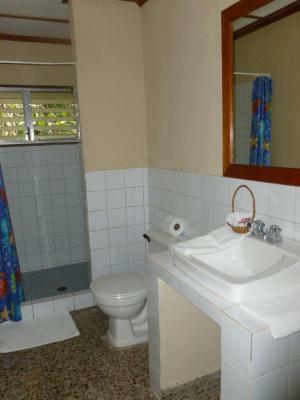 Other services offered at the property include laundry facilities. An array of activities can be enjoyed on site or in the surroundings, including cycling and hiking. The property offers free parking. 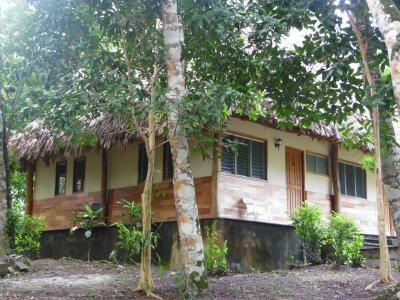 The property is 50 minutes’ drive from Mundo Maya International Airport. 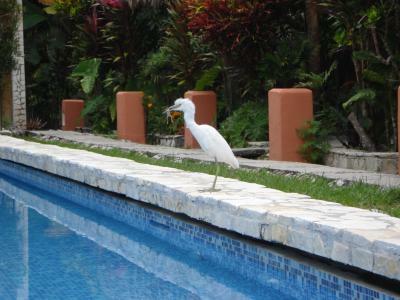 Various activities, such as bird watching, are possible on site. 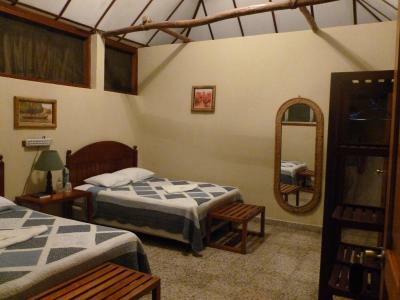 When would you like to stay at Tikal Inn? 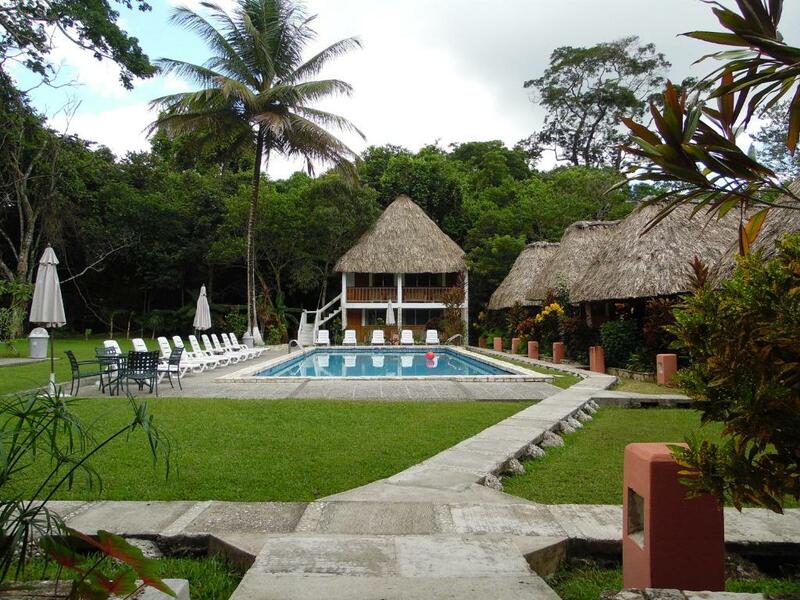 House Rules Tikal Inn takes special requests – add in the next step! Tikal Inn accepts these cards and reserves the right to temporarily hold an amount prior to arrival. Keep in mind Tikal Inn doesn't have continual power supply, electricity is provided by our own generator and It’s available from 6:30 A.M. to 08: 00 A.M and from 6:00 P.M. to 10:00 P.M. There is no fiber optic networks coming in to Tikal either, Internet service is satellite based and subject to atmospheric conditions. Please note that reservations of 4 or more rooms, a group policy is applied. A non refundable deposit of 50% is required upon booking for groups of 4 or more. Expensive, due to location. Food ok, but fairly basic. Location amazing, right nxt to park entrance. Wildlife all around grounds of hotel. Pool area a good place to relax. 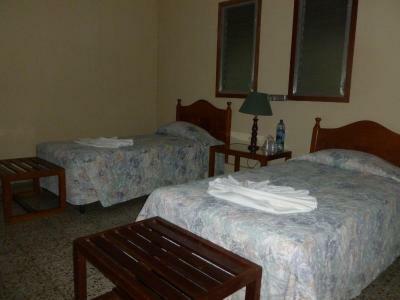 Rooms a decent size, beds have new mosquito nets, hot water from 1800 - 2130 when electricity on. Free water provided in room. Staff friendly & helpful. Spotlessly clean. Food was so so, just acceptable, however that is to be expected in the jungle isolated environment. 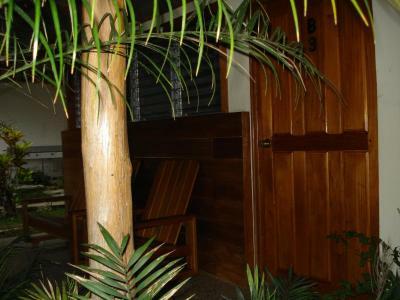 Cabana was good size for 3 adults, clean and private. 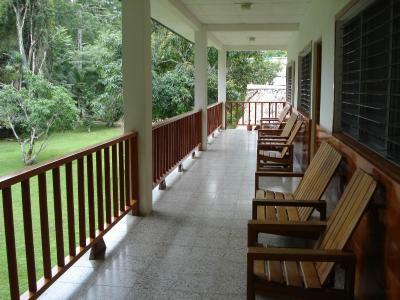 Every day at 4 pm we would sit in the lounge chairs on the front deck of our garden view and watch spider monkeys play in the trees outside our room. Lots of wild life in the vicinity. Very close to Tikal park entrance and great to beat the crowds that arrive on buses later in the morning. No power most of the day when it is really hot. Needed to have the fan going since there is no air conditioning. Only has power from 6:39 to 7:30 in morning and 6 to 9 at night. Other reviews complained about limited power. This is true for both hotels inside the park- it is an environmental policy of the park to limit power and light pollution. Checkout was at 11:00 am. 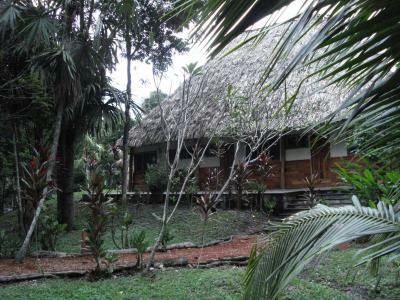 Great place to stay in Tikal park. The restaurant food was very good and reasonable. The room was a bit damp, the floors were wet. However, most of the time we have spend outside, so this did not bother us much. I loved the hotel because it was right inside the park. 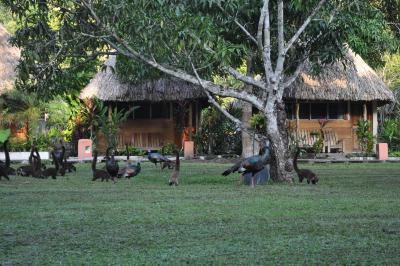 Absolutely stunning experience, living inside the tikal park among the animals. You can hear the howlers at night and see the glow worms on the lawn. The complementary sunrise tour was a special add on. They even arranged for some coffee at 4 am in the morning before we left for the tour. The breakfast and dinner served were sumptuous. I can't expect more at this remote corner of the world. The staff were very nice and friendly, attended to all our requests. I would recommend this hotel for travelers and backpackers. This hotel is definitely not for luxurious travel, the wifi and the electricity is limited, since this is in a remote jungle area. 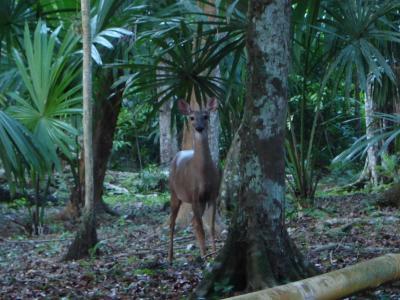 However, that's the beauty of staying in a jungle resort. Also, this hotel is just 25 mins walk to the ruins (which is the best part) I absolutely loved it, will come back again. The kitchen menu needs some improvement. The food is not bad but is not excellent. The food at the restaurant is a joke. Exaggerated prices as if we were in the remote jungle with no paved road. Everything had a price even an extra slice of cheese was 4 quetzal. Electricity was only available a few hours at night and not in the early morning despite the regular 4:00 AM sunrise tour that many visitors do. Just stay in El Remate. All the hotels out here are on a limited power schedule. It's not a big deal if you plan accordingly. There is no ac, so that means you'll keep your windows open and that can get a little loud. If you come during the high season you should bring earplugs because sound will go through the walls and open windows easily. We got the cheapest room which unbeknown to us meant that we were away from the main section of the hotel, its a bit of a walk and feels like you have been shoved away to the side. The restaurant was expensive as these things tend to be as you are over a barrel. Also we didn't get any hot water during our stay. The location is right in the park which makes life really easy and pool was a welcome addition, especially after walking around temples in the heat. Hotel's a bit pricey given the room and having no electricity or hot water most of the day. No mosquito nets in the room (very much needed). 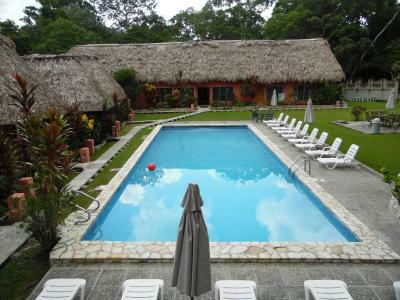 Great location, walking distance to the Mayan Ruins of Tikal. Offers good tour packages to visit Tikal. 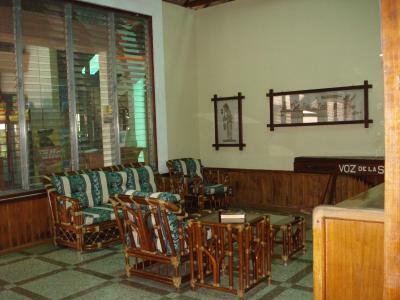 The hotel offers a good restaurant on site with great service.